I’ve talked before about how I was giving the Pomodoro technique a try. It’s been a few months since then and I was right in the sense that my enthusiasm for sticking with the technique waned after a period of time, but surprisingly, I’m still interested in using it. I think that means this system is working for me; I just need to improve it a little. Besides the obvious goals, I discovered that the best way to keep up the motivation for anything that spans over a long period of time is to keep track of your progress. It keeps you accountable for each day and your failure or success determines how you will work in the future. Normally, if I let a task slip by, I feel bad about it but I eventually forget about it and move on. With tracking it, however, those slips are recorded “forever” and I can visually see if I have been making up for it or not. Over the past few months, I’ve gone from making ticks on a piece of paper taped to my wall to recording how many sessions I did per day on a print-out calendar. They worked okay for the time being, but now I want something that looks a little cleaner and purposefully tailored for Pomodoro. Something to up the motivation factor a little bit. A Google search led me to this very nice tracking sheet. I loved the idea of it, but unfortunately, even after viewing it on 3 different computers, the document wouldn’t print out properly. So, I created my own modified, simpler version on MS Word. Since it’s on MS Word, it can be easily altered for future use. I have both .pdf and Word Document files for download in case you have issues viewing the tracking sheet mentioned above as well, or you just prefer having something you can customize yourself. Pomodoro sessions are done in chunks of 4 sessions (each session = 25 min. ), so that’s what the gray, vertical bars are separating. The first chunk of 8 blocks are “mandatory” so that’s why there is a pink bar stretching overhead and that is why there is no checkbox symbol until after the 8th session. The next 8 sessions are “optional.” I love this “rule” for the checkboxes, because it makes it seem like the first 8 sessions are mandatory, so you don’t get the satisfaction of making a checkmark until you completed your task. If you go beyond the mandatory sessions, then you continue to get the satisfaction of making checkmarks every 4 sessions. You’d be surprised how satisfying those checkmarks can be when you’re hard at work on something. 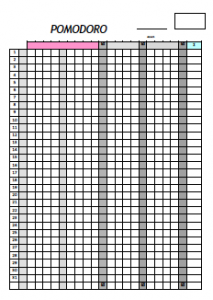 The boxes in the last column are for recording the total number of sessions you did for the day. The box in the upper, right hand corner is where you put the total number of Pomodoro sessions for the month. With that, it is easy to calculate how many hours of productivity you completed. Good luck!